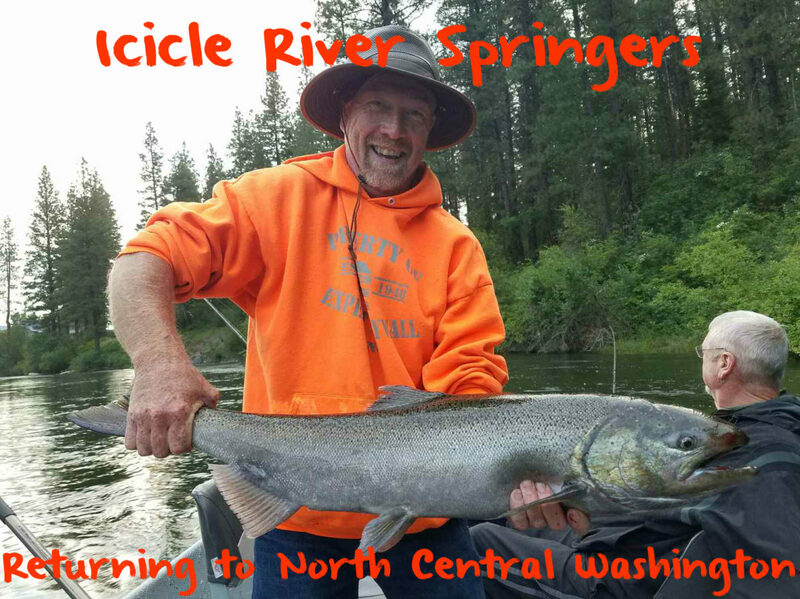 In North Central Washington the Icicle River’s springer fishing is a big deal. It marks the first of our salmon fisheries that opens. It’s one of our fisheries that have been consistent for a long time and it’s a cool fishery. It’s a small river where you can catch big salmon and there’s a lot of big salmon here now. A small, clear running, mountain stream that flows into the Wenatchee River near the Bavarian themed town of Leavenworth there’s a lot of springers around in the Icicle this June. We’ve had more than 7,742 springers cross Rocky Reach Dam and make the turn up the Wenatchee River in route to the Icicle River. That’s a lot of fish for a small river, but not all these are going to the Icicle. Most of these fish are in route to the Icicle. A few will be going to other hatcheries in the region. Early to mid June marks the middle of springer season and it’s been a good one so far. With bank access difficult it’s best to float or hire a guide. Drift boats float from the Icicle River Federal Fish Hatchery to the Leavenworth pullout. It’s a small section, roughly two miles, but draws crowds. Fishing has been consistent for those putting their time in. Some days we’ve had to work hard, but most we catch fish. With only handful of consistently fish producing holes competition is fierce. In fact, it creates fanatical anglers. In pursuit of one of tastiest fish on this planet many sleep on the river to clog their favorite fishing hole. Traveling more than 500 river miles from the ocean these fish are loaded fat and oil. Be careful they can light a grill on fire. The fishery is native release, but you can use barbs. Typical, set ups are mostly plunking rigs. With such a small section of river open it’s primarily an anchor up fishery, although there are a few plug-and-bait and diver runs in between holes. A plunking rig is basic. We are using a 2-8 ounce dropper weight (depending on the hole) with a one-foot dropper on a slider. 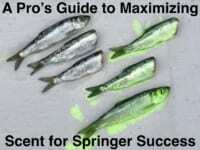 Then we tie on a swivel, three-to-four feet of 20-pound Maxima Ultragreen and a size 2/3 Spin N Glo. 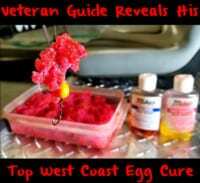 For bait, I’ll run and a Chartreuse, Green or Purple Fire Brine herring or Red and Pink Fire Brine eggs. I’m doing something different with my herring this year. In addition to the Fire Brine I’m adding a quarter-cup of powdered milk to a full bottle of Fire Brine. The powdered milk toughens the skin of the herring without drying it out. It keeps your bait oily, whereas using more salt dries the bait out and creates a more leathery piece. Adding the powdered milk keeps the outside tough and the inside oily. Editor’s Note: The Icicle closes at the end of July, but only fishes well through early July. Anglers may keep two fin clipped hatchery daily. Brad Wagner operates Bobber Down Guide Service. For more info on his Icicle River springer trips please visit http://www.fishwenatchee.com or https://www.facebook.com/Bobberdownguideservice.